With Easter nearly upon us, there is a frenzy of chocolate egg buying and giving – and of course EATING! This morning a co-worker set up an office Easter egg hunt before piling mounds of Easter cakes, chocolate and eggs onto the ‘treat table’ for all to indulge. What a nice way to start the penultimate day at work before I find myself gainfully UNemployed. It is a sorry state of affairs and I will mourn the past four months which have rescued me from the isolation of my previous job. I have certainly felt more alive, more inspired and more ‘me’ since changing jobs, and although the risk taking didn’t quite pay off, there is still a glimmer of hope on the horizon. So don’t start sending me your messages of condolences just yet. 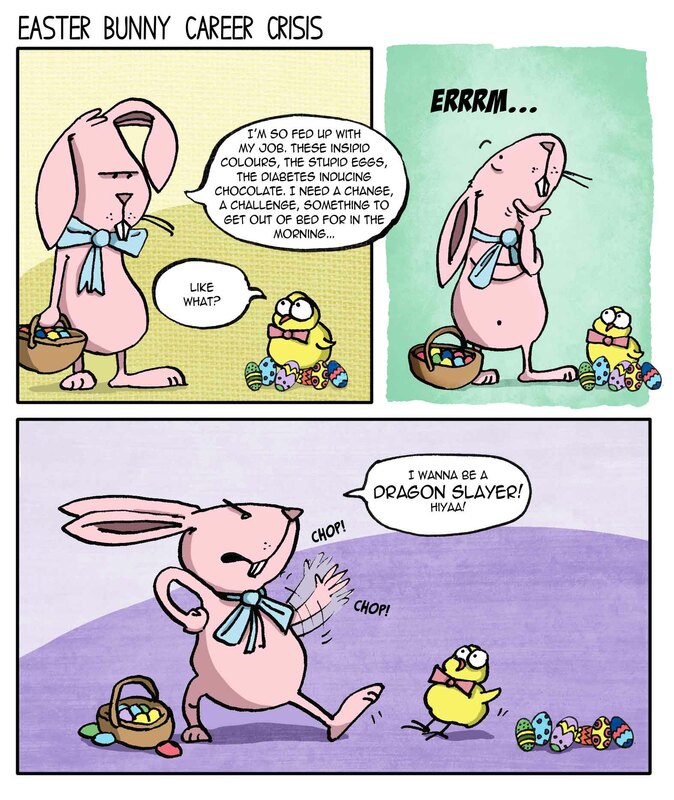 In the meantime, here is a little cartoon to celebrate Easter. This entry was posted in Animals, Life, Rabbits, Work and tagged animals, cartoon, dragons, easter, funny, humor, rabbits by bighair63. Bookmark the permalink.